There is no fixed time for emergencies like floods, earthquakes, fire breakouts, accidents etc. They are completely unpredictable whether natural or unnatural and, require shelter camps for the victims. Many unnatural emergencies like Bathroom Blockage/Leakage, Toilet Breaks, Extra Guest also require urgent alternate facilities. There are two major facilities required at that point of time i.e. medical facilities and washroom facilities. Various bathroom renting companies offer exclusive customized portable bathroom services for the medically ill patients. During the times of emergency situations, it is very important to set up portable mobile ensuite to accommodate the needs of the patients. What are the advantages of portable toilets during Emergency times? Easy – Mobile ensuite available on rent are quite easy to use. 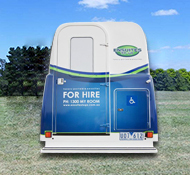 We have an experience of offering customized portable bathrooms on rent in Melbourne exclusively for the physically unwell patients. The washrooms have enough handles for sitting and standing for the convenience of the patients. User Friendly – Portable bathroom offered by us are very user friendly and comfortable for both kids and senior citizens. Our expert engineers can uninstall the units for the comfort of the kids who are unable to move frequently from one place to another. Convenient – We also provide movable potty rentals that can be easily installed inside the rescue camps. Cleaning Staff – Our cleaning staff shall be available for keeping the bathrooms hygienic and free of infections as this is the need of the hour during the emergencies. Luxury Ensuite – we use high quality anti-infective material for manufacturing the luxury bathrooms which are efficient enough to prevent them from any sort of infection and germs. Water Facility – We provide 24*7 warm water facilities in the portable bathrooms. This facility increases the convenience of the people during the emergency situations.